The NASDAQ 100 index (NDX), which includes 100 of the largest domestic and international non-financial securities listed on The NASDAQ Stock Market based on market capitalization, has outperformed the S&P 500 Index since June. That being said, it is now approaching a test of both trend line and “channel top” resistance currently sitting at the 3,185 level with overbought conditions present on weekly and monthly charts. Led by components Facebook (FB), Tesla Motors, Inc. (TSLA), priceline.com, Inc. (PCLA), Netflix, Inc (NFLX) and others, the NASDAQ 100 has held near its yearly highs in recent weeks despite more noticeable setbacks in the S&P 500 and Dow Jones Industrial indices particularly since the taper-talk began in May. Nevertheless, overbought conditions on the individual components of NASDAQ 100 suggest that a rise above key resistance at the 3,185 level on the index itself will likely be difficult to achieve. One of the near-term hurdles to deal with is the month of September itself, which has historically been the unkind to equity markets. Add in the unknown consequences of the U.S. getting involved with the Syrian government as it is engaged in a civil war; anxiety over the possibility of a taper; the likely controversy over the impending change at the helm of the Federal Reserve; and a move toward higher long-term interest rates makes for a murky kettle of soup. Although it is 7.1% below the close of Friday at 3,074, a break below key trend line support currently sitting at 2,870 would have a negative influence on NASDAQ stocks, should it occur. Such a break could also be a signal that suggests a more pronounced move to the downside for equity prices in general could unfold or even accelerate. 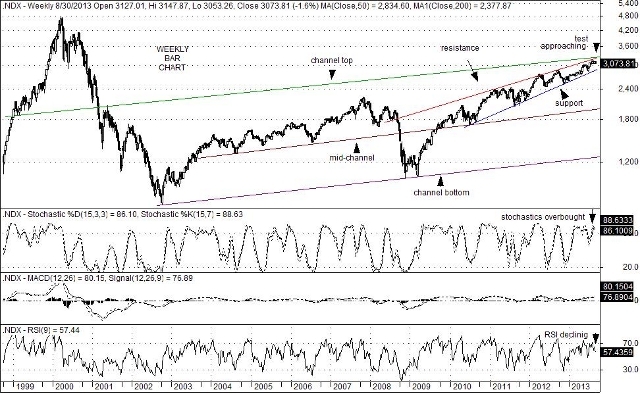 This entry was posted on Sunday, September 8th, 2013 at 10:22 pm	and is filed under NASDAQ 100 Index (NDX). You can follow any responses to this entry through the RSS 2.0 feed. You can leave a response, or trackback from your own site.